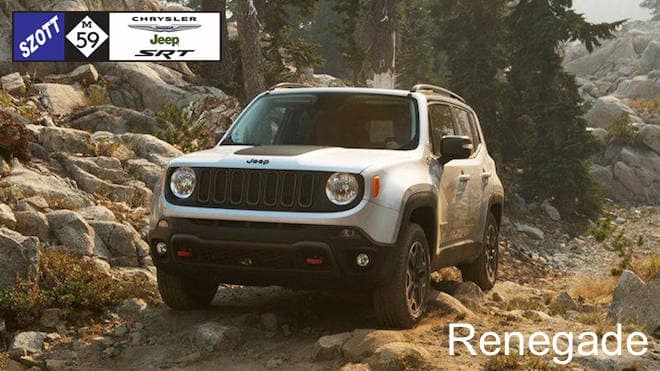 " /> Jeep Renegade White Lake MI | Szott M-59 Chrysler Jeep " "
Chrysler Jeep Lease Deals in the D! Equipped with all the essentials for your every adventure, the all-new Jeep Renegade stacks high against the SUV competition with it’s Trail Rated badge of honor and available Best-in-Class 4×4 capability found in the Trailhawk. At Szott M-59 Chrysler Jeep we have a handsome and rugged lineup of new and pre-owned Jeep vehicles that are just waiting for you to explore. Browse our selection online ahead of time at our user-friendly website, or turn that daydream into a reality by visiting our showroom in White Lake, MI and picking out your favorite Renegade for a test drive today. With the available Selec-Terrain traction control, you’re certain to dominate all terrains; from rain and snow, to sand, rock and mud, you’re in control. The impressive and fuel-efficient 2.4L Tigershark I4 engine delivers 160hp and 184lb-ft of torque and 31 highway MPG, providing a harmonious balance between power and fuel economy. Rigged with large ventilated front and solid rear disc brakes, your Renegade also features serious stopping power as well. The icon seven-slot grille returns giving your Renegade that classic Jeep appearance while the available MySky open-air dual-panel roof, offers a whole new fresh and open look and feel by allowing you to completely remove the panels and store them in the cargo area. Available roof rails offer up prime rooftop real estate for your kayaks, canoes, and bikes, while the Best-In-Class interior volume with the fold flat front seat and 60/40 splitting rear seats provide you with all the versatile space you’d ever need inside the cabin. A number of preventative safety technologies actively guard you through every step of your trip. ParkView Rear Back Up Camera, Forward Collision Warning-Plus, LaneSense Lane Departure Warning-Plus, and Blind Spot Monitoring all work to keep you comprehensively informed of any unknown dangers waiting to jump out at you while superior tech like Hill Start Assist help you maintain control as you traverse steep grades through the mountain tops. Explore every intuitive tech feature your new Renegade has to offer when you visit our Szott M-59 Chrysler Jeep. We can’t wait to professionally fit you into the Jeep that will help you accomplish your every adventure, so call us at (888) 571-3764 to set up a test drive or drop by the showroom during our convenient hours to begin exploring our outstanding selection today. Szott M59 Chrysler Jeep has the perfect new Jeep Renegade for you. Find it here, along with White Lake’s best service and value. Get it all today. A fun, ultra-savvy lineup of vehicles like Jeep is always in high demand. That’s why we also carry an exciting selection of pre-owned models from which to choose. Check it out today! Why not enjoy your new Jeep along with the Szott M59 Chrysler Jeep discount? You can have your cake and eat it, too. See what’s available for you and your new Jeep from Szott. Buying a vehicle is a special experience. We understand that this isn’t something our customers do every day, which is why we treat every interaction with the respect that it deserves. Szott M59 has loyally served the White Lake market for decades because we believe that the community and its people supersede any expectations set by a corporation. This is your community. This is our community. When you are shopping for a new or used car like the Jeep Renegade, you expect the experience to match the promise, which is why we are open and transparent every step of the way. Below, you will find more information about the new Renegade. We hope that you’ll contact us and allow us the opportunity to show you why buying from the pros at Szott M59 Chrysler Jeep, is simply the best decision you can make. There’s more to a vehicle demonstration than picking out colors and taking a test drive. At Szott M59 Chrysler Jeep, we want you to know everything that’s important to YOU in your next new vehicle. The new Jeep Renegade is uniquely positioned in the White Lake market to satisfy the needs of practical fun lovers everywhere—the Renegade has the proper mixture of athletic performance and supreme comfort that’s appealing to White Lake. Our team is here to make sure you’re aware of every feature, tip, and maintenance best practice because we take pride in delivering the ultimate shopping experience for our customers. Watch this video to get your engine revving for your new Renegade, and then let the pros at Szott M59 take care of the rest. Attention to detail is important. You won’t miss a thing when you shop at Szott M59 Chrysler Jeep. We know you have many options when it comes to car dealers in the White Lake area. Our hope is that you will give us the first opportunity to earn your business because of the tremendous experience, great pricing, exciting Jeep selection, and our commitment to making your buying experience the most positive one you’ve ever had when shopping for a vehicle. We stand behind the ideal of delivering the type of respectful engagement that the people of White Lake deserve. If you give us the first opportunity, you’ll see why our customers come back time and time again. WHY SZOTT M59 Chrysler Jeep? Some dealerships take pride in their sales numbers. Others point to their P&L statements to determine their success. At Szott M59 Chrysler Jeep, the most important indicator of whether or not we’re successfully achieving our goals is when YOU are overwhelmed by our outstanding customer experience. It goes beyond satisfaction. We want you to be ecstatic with the way you were treated and impressed with how easy it was to get the best Jeep deal in the whole state of Michigan. Your opinion is the one that matters to us at Szott M59 Chrysler Jeep. It’s what drives our success. Denise is great! Always get our vehicles from her without an issue and is not pushy! Traded in a 2013 Charger SXT on a new 2018 Charger GT. My wife couldn’t be happier with her new car and Will Jackson was the best salesman we could have found. He was very easy going with no pressure at all we told him want she wanted. And the options we were looking to get. We did all the paperwork at his desk with no finance manager pressuring us for other things. Overall it was one of the top car buying experience we have had. I’ll definitely go back in the future. Everyone at this dealership was friendly and helpful. They helped me find the exact vehicle I was looking for and when I was a little indecisive on if I wanted to make this large of a purchase they allowed me to take it home that night and the next day to get feedback from my family. They worked with me on the price of the vehicle. The staff here we're NEVER pushy and I never felt talked down to because I was a female. I will continue to purchase vehicles from this dealership from here on out and so will my family! So friendly, helpful, accomadating, and informative! Both Derecks are awesome!Second time in for car. Second review. Awesome service, employees are awesome as well. Both Derecks were once again friendly, helpful and accomodating! I just picked up my new Ram from Szott M59 Dodge Ram and not only do I love my truck but the buying experience was great too! My sales person Stephanie Pearson was very knowledgeable, straightforward, genuine and honest. Everything she said she was going to do followed through and without any questionable sales tactics. I highly recommend going to see her, you won't be disappointed. We hope we’ve answered most of your questions about why you should consider Szott M59 Chrysler Jeep as your first choice when shopping for a new or pre-owned Jeep model. If you are ready to learn more, please contact us through your preferred method of communication and ask us anything you’d like to know. If you’re ready to schedule your test drive, please use the form below. At Szott M59 Chrysler Jeep, you control your shopping experience. We’re here to help facilitate and to be your own personal Jeep experts. Szott M59 Chrysler Jeep	42.6480686, -83.5233205.